Pickerelweed or Pickerel Rush (Pontederia cordata) 北美梭魚草or海壽花 Love the packaging! Comes with flower suppose to be! 包裝得真好! 附上一枝它的人造花開花的樣子. Pickerelweed or Pickerel Rush (Pontederia cordata) 北美梭魚草or海壽花 One plant inside from root division. 內有一株分株來的植株. Love the packaging! Comes with flower suppose to be! 包裝得真好! 附上一枝它的人造花開花的樣子. Pickerelweed or Pickerel Rush (Pontederia cordata) is forming the flower stem. 北美梭魚草or海壽花花序形成中. Pickerelweed or Pickerel Rush (Pontederia cordata) is flowering! 北美梭魚草or海壽花開花了! Pickerelweed or Pickerel Rush (Pontederia cordata) 北美梭魚草or海壽花 Each small flower only last a day but everyday got something to enjoy! 每朵小花只開一天但開花不斷,一直有花可賞. Aquatic native perennial. Easy to grow. Best growing in full sun location in pond or wetland area. Small dark blue flowers on a flower stem bloom from late spring to fall. All plant is edible by human and wildlife. USDA Zones:3-9. Mature size:3′-4′(H) X 3″-6″(W). Propagate by seeds, cuttings/offsets, rhizomes or division. Fast growing. 水生的原生多年生草花. 容易栽種. 最好栽種在全日照處的池塘或溼地. 春末到秋初開深藍色小花的鼎生花序上. 全株可以為人或動物所食用. 耐寒也算耐熱. 成熟株高3-4呎,寬幅3-6吋. 繁殖方式以種子,扦插/側芽,地下莖或分株的方式來進行. 生長快速. American persimmon (Diospyros virginiana) edible ripe fruit in late fall. 美洲柿秋末的成熟果實. Fruit is small and quite seedy but sweet. 果實小且多籽但是蠻甜的. American persimmon (Diospyros virginiana) seeds. 美洲柿的種子. American persimmon (Diospyros virginiana) seeds start to germinate in day 21. 美洲柿的種籽第3週開始陸續發芽. American persimmon (Diospyros virginiana) seedling (2nd year). 美洲柿實生小苗(第2年). Cold hardy fruit tree. Easy to grow. Best growing in full sun location. White/green flowers in late spring to early summer. Flowers attract bees and butterflies. 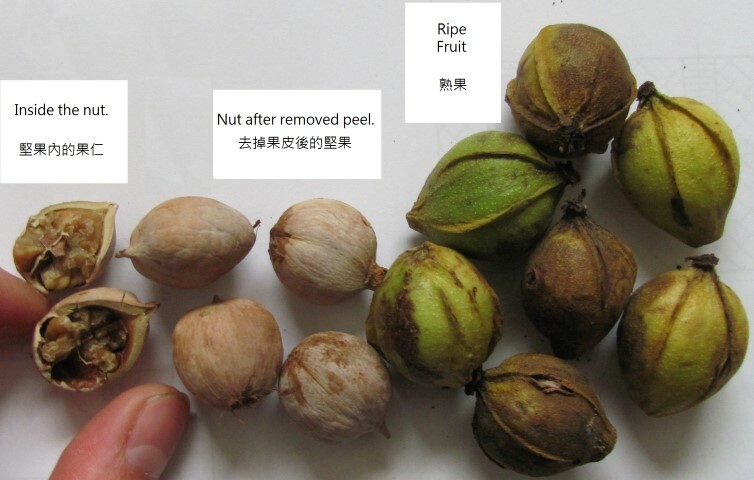 Plant is either male or female so will require both to produce fruit. Better grow enough to make sure able to have both male and female plants flowering at the same time. USDA Zones:5-9. Mature size:30′-40′(H/W). Propagate by seeds or air-layering. Sweet ripe fruit can be harvested around frost time in fall. 耐寒強健的果樹. 容易栽種. 最好栽種在全日照處. 春末夏初時開白綠色的花. 花頗吸引蜂蝶. 植株是雌雄異株. 需要多種幾棵以保同時雄株與雌株能同時開花以授粉結果. 耐寒也耐熱. 成熟株高/寬幅30-40呎. 繁殖以種子或高壓的方式來進行. 秋天霜降前後果熟可以採收. 果實味甜. Red Trillium (Trillium erectum) seed pod and seeds. 直立延齡草or紅花延齡草的種莢與種子. Red Trillium (Trillium erectum) seeds start to germinate after 3 months! 直立延齡草or紅花延齡草種子播種3個月後開始發芽了! Red Trillium (Trillium erectum) seeds germination. 直立延齡草or紅花延齡草的種子發芽. Cold hardy bulbous perennial. Easy to grow. Best growing in partial shade to light shade location in moist soil. Showy dark red flowers in mid to late spring. Flowers attract bees. USDA Zones:2-8. Mature size:1′-1.5′(H) X 9″-1′(W). Propagate by seeds (do not store well), rhizomes, tubers, offsets or division. 耐寒強健的多年生球根花卉. 容易栽種. 最好栽種在半日照到散光處,排水佳的濕潤土壤. 仲春到春末開亮麗的暗紅色花朵. 花頗吸引蜂類. 極耐寒但不甚耐熱. 成熟株高1-1.5呎,寬幅6吋到1呎. 繁殖以種子(活性短,無法久存),地下根莖/球根/側芽或分株的方式來進行. Shagbark Hickory (carya ovate) nuts. 糙皮山胡桃樹的堅果. 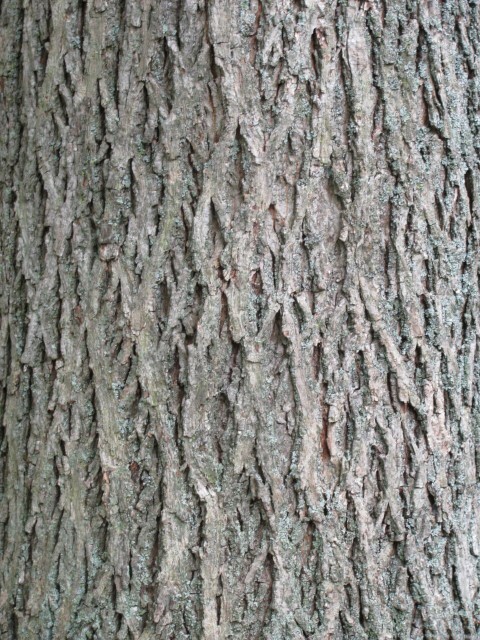 One of the native hickory species. Very hardy. Best growing in full sun location. The shaggy bark is making this tree easily identified. Small flowers in mid spring and edible nuts mature in late fall. Nuts attract birds and other wild animals. USDA Zones:3-9. Mature size:40′(H)/(W). Propagate by seeds. Wood are used for smoking meat, gives flavor to food and are used for making tools and equipements requie higher strength, such as axe handles, ploughs, skis, and drum sticks…etc. Bitternut Hickory/Yellow-bud Hickory (Carya cordiformis) seed germination. 心形山核桃的種子孵出,約6個月. Bitternut Hickory/Yellow-bud Hickory (Carya cordiformis) tree bark. 心形山核桃樹幹的皮紋. This native deciduous tree is very hardy. 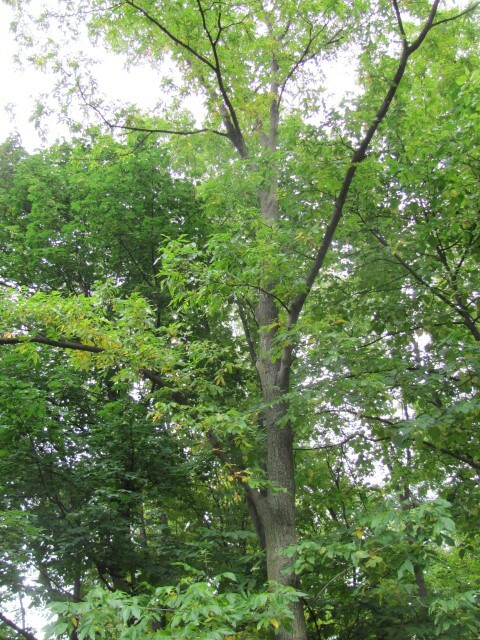 Bitternut hickory has short life span, around 200 years. It has been grown for commercial lumber and pulpwood because its hard wood. The wood is common used for smoking meat. Wildlife enjoy its nuts but not edible for human. Easy to grow in full sun to partial shade location. Tiny yellow green flowers in spring. Foliage turn golden yellow in fall. Mature size:40′(H)/(W). USDA Zones:3-9. Propagate by seeds or cuttings. 這種是非常強健的原生落葉喬木. 它是同屬中平均壽命最短的一種,約200年. 它常用來種植取其硬木木材作為傢俱及其造紙的木漿. 木片常用於燻肉用看過有賣一小包還不便宜. 它的堅果野生動物喜食,但人類不能食用. 容易栽種於全日照到半日照處. 春開穗狀小小的黃綠色花. 葉子的秋色為金黃色. 成熟株高及寬幅為40呎左右. 耐寒耐熱性佳. 繁殖以種子或扦插為主.